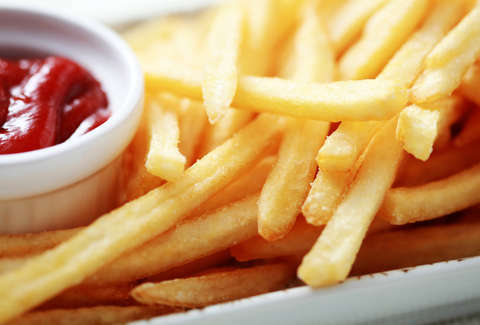 Harvard Expert Says You Should Eat Only Six French Fries Per Serving. Six. French fries are a universally loved indulgence. Whether straight cut, curly, or waffled, most people would agree a mountain of crispy golden potatoes is the perfect accompaniment to almost any meal. Harvard University Professor Eric Rimm, however, is not most people. In a recent New York Times article, the Ivy League scholar dropped the absolute bombshell that French fries, while delicious, are not that good for you (we’ll give you a moment to digest that life-changing news). What’s more, he suggested scaling back on your fry consumption -- to an extent that’s been widely been viewed as laughable, if not not downright outrageous. “I think it would be nice if your meal came with a side salad and six French fries,” Rimm said in the piece. The internet reaction chamber that is Twitter was shaken to its core by this suggestion, and understandably so. Side salad replacing a heaping helping of fried potatoes? Never. People from every corner of the web weighed in on Rimm’s idyllic (more like nightmarish, but to each their own) serving size, and they had a lot of feelings. Rimm responded to the backlash in an email to USA Today admitting that it was admirable how everyone was so willing to go to bat for French fries. He maintained, however, that our relationship with the fried vegetable is unhealthy. Our love of fries may kill us, but we’ll die happy and full and that’s all you can really ask for… right?